There are 6 courts in the Holy Trinity Badminton Club, capable of accommodating about 48 people at a given time. With 48 people, 24 would be playing, and 24 would be sitting off. And, if there's only a 50% attendance rate, the club can accommodate 100 members. The club does not provide showers, but there are washrooms to change in. There are water fountains for drinking from and refilling water bottles with. The badminton club has adequate lighting, and large tables to sit at while waiting for a badminton game. The tables are near power outlets, for those times you need to bring a laptop to work or study between games. The Holy Trinity Badminton Club has FREE parking. The recommended parking lot to use is on the east side of the facility, but there is also a parking lot on the north-west side of the facility. 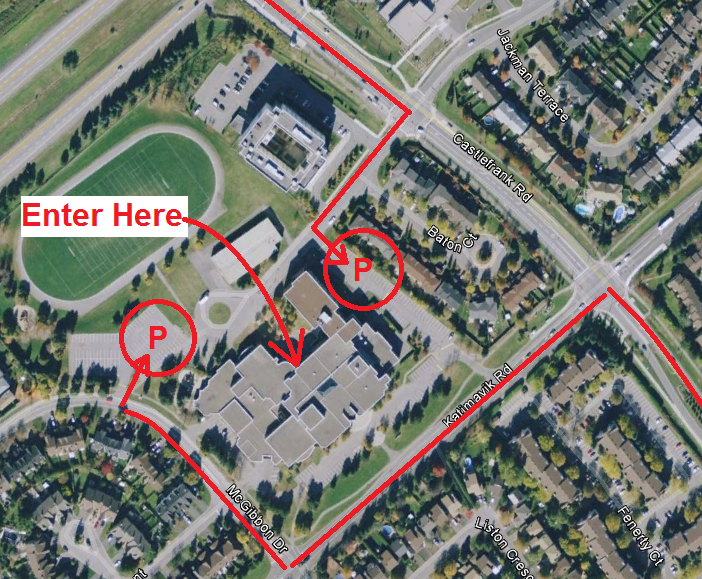 Please use the North entrance of the facility to enter the badminton club. In the satellite image below, the best parking spaces are circled in red. Please use the entrance, as directed by the arrow.